How projects come together - DIY vs Full Service Design. I'm so pleased to share my latest completed project! It was a tough time, but we got there in the end! This started out as an e-design project, but the client encountered several huge and unexpected issues with her remodel (which had begun before we met). It ended up being 90% a full service project because of these issues. Because of this, I was able to stage the project and photograph it, which I would not normally for an e-design. Coming to post these photos got me thinking, and I wanted to write a little about the differences between e-design and full-service projects. If you're just here for pretty pictures, you can view the full project at the bottom of this post or under 'WORK'. A fully staged space - the furniture, pillows, flowers, accessories, artwork is all arranged for you just as it was imagined by your designer. I'm often asked the difference between an e-design 'DIY' project, and a 'full service' design, and what is right for a client. With an e-design project, the designer provides you with a floorplan (usually based on your own measurements), a board with a furniture/accessories list, typically for retail only items the client can purchase in their own time. For those who want help with their homes but like to take control of the project management, purchasing, implementing and styling of their projects, these are a great, low-cost choice. E-design is not for everyone. Many design firms don't offer it at all, because it can be really difficult to have so little control over your plans. Once the client ends up with the plan and implements it, it can end up quite different from what the designer envisioned, especially if they decide to substitute items (which sometimes is unavoidable when you are buying retail - things get discontinued much faster as seasons and trends change). Additionally because of this, if you are working to build a portfolio, it can be difficult to get work that really represents you as a designer photographed with e-designs. In terms of what you end up with in your home, the difference can be enormous. It isn't simply the difference between having all the 'staging' done for you, though this alone is worth it to many people. Full service design means your designer is there for you every step of the way. If you are renovating, this is enormous. Most people, especially on a first time remodel/build massively underestimate the amount of small but cumulative decisions they will need to make through the process. Of course, having an really great contractor/build team makes the world of difference here too, but even with that in place, the homeowner is still required to make a decision on everything. Let's say you are doing a 'simple' kitchen remodel. You'll need to make choices at the very least (and sometimes very quickly) on flooring, hardware, lighting, paint, countertops, backsplash, cabinets, paint, faucets, sinks, appliances, paint, and any number of hidden extras. Selections that needed to be made to create this kitchen include cabinets, flooring, tile, grout, countertop, custom shelving/hardware, appliances, furniture, faucet, sink, paint, three styles of cabinet hardware and lighting. A designer in your corner can make the world of difference here. They will work with you before the remodel begins to understand your wants and needs, and if there are surprises mid-project (surprise! Your tagged, beloved, granite slabs you already spent hours pairing your backsplash tile with were accidentally given to someone else! Yes, this happened to a client recently) they will work with you to quickly fix the issue, make sure there is minimal impact on the project and cause you the least heartache possible. If you are the type of client who begins their project dreaming of coming home one day to a polished, beautiful interior that could grace the pages of a shelter magazine, full service design is what you want. Staging a home (which is what has happened before you see those beautiful 'after' shots in the magazines/on pinterest) takes many hours. Tracking down the right pieces (within budget), delivering, moving furniture, scouring the client's own home for forgotten art work or accessories you can use. Most designers working on full service projects install everything in one or two days at the home. There are a number of reasons for this. A staged, finished space - flowers and accessories make a huge difference. 1. Many trade only vendors will only deliver to a warehouse, not directly to a clients home. This means you may have several pieces of furniture sitting in the receiving warehouse waiting for all the parts of the puzzle to arrive. It is less expensive both for delivery and for hourly fees to the design team to bring all the parts at once, rather than arrange delivery for each item. 2. Many clients find it difficult to visualise their completed space, even with boards, plans, and even renderings. That's often why they are coming to a designer in the first place. For these types of client, having parts of the project turn up bit by bit can be hugely unnerving. They see the part alone, not as a piece of the whole, and get scared/decide they don't like it. For this reason many designers prefer the client to see everything as a whole on install day - it saves a huge amount of stress for everyone. 3. MOVE THAT BUS! OK, had to fit an EM:HE joke in there somewhere. Do you ever have those dreams where you find a secret room in your home? How else can you get the magical feeling that you have come home to this amazing place that you just can't believe you are going to get to live in? Yes, it's a bit of showmanship. But having watched countless reactions as people see their spaces for the first time and cry/beam with joy/go around discovering new parts they love, it's definitely a huge bonus to installing all at once. If you aren't great with managing projects, or don't have much time to spare, full service design is really the best way to ensure an outcome you love, with the minimum effort needed by the homeowner to achieve their goal of a beautiful home. If, on the other hand, you are the type of client who knows their own style well, loves project managing contractors, implementing projects, has a great eye for styling, and is able to take time off work for multiple deliveries, e-design can work really well for you. It's also a great way to inexpensively tackle smaller spaces that are less involved, and can be shopped for in just a few retail stores. If you're considering e-design or full service and want more information, feel free to contact me! In the middle of a difficult renovation of the ground floor of their newly purchased home, the new owners were overwhelmed and needed assistance. 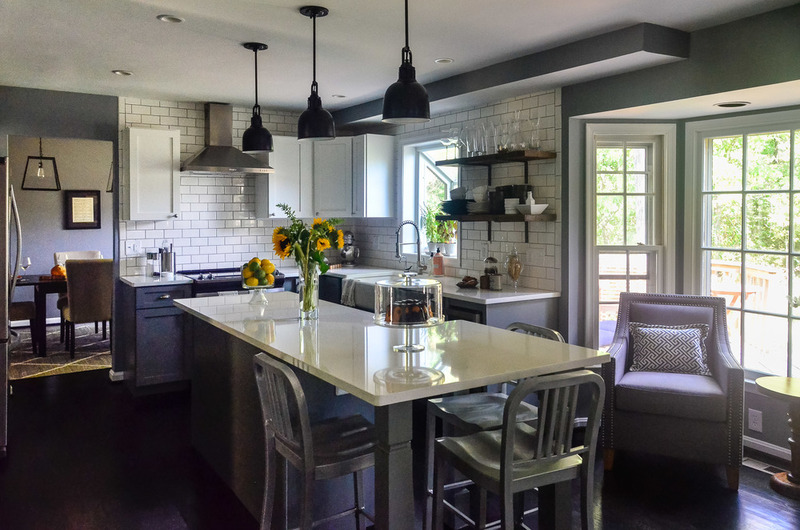 Vesta Interiors came on board to help them create a functional, beautiful kitchen and relaxed, welcoming adjoining living spaces to unwind after a hard days work and entertain friends and family.